The most important sources of amethyst are located in South America with mines in Brazil and Uruguay. Amethyst from Brazil, very little included, is often of pale colour. It is present in the states of Minas Gerais, Rio Grande del Sul and Bahia. Amethyst from Uruguay, found in the North in the state of Artigas near the Brazilian border, has a more pronounced purple tint and sometimes can reach the "Siberian" quality. We also find, among other stones, amethysts in Argentina in Wanda mines near Iguazu Falls at the border with Paraguay. Mexico with mines in the State of Vera Cruz and Guerrero produced some stones but these mines seem to be almost exhausted. In Africa, in southern Zambia, the district of Kalomo is the main source of beautiful quality amethysts. This region produces amethysts since the 60s and numerous mines as those of Mapatizya, are in exploitation. The centre of this country also produced some stones of beautiful quality. Zambia exports more or less every year 1 000 tons of amethyst in all qualities. Generally, stones of south America are more important in size than those of Africa which, on the other hand, have generally a deeper colour with smaller sizes. The dry Namibia with its deposits situated near the mountains Goboboseb produces light coloured stones of good clarity. This deposit is related to the Brazilian ones, both continents being separated since more than 150 million years. Madagascar sporadically produces some amethysts of beautiful quality. In Asia, India produces amethyst crystals which are generally carved in Cambay, Gujarat and in Jaipur, Rajasthan. Europe is not outdone by small deposits found in Italy, Germany and Russia. Sri Lanka and China also produce some crystals. Very dark amethysts are produced in Australia. 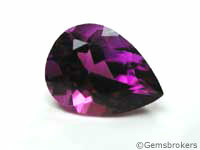 The variety Rose of France, that came back recently as fashionable, describes a clear amethyst with a small tint of pink. The Anahi-Yuruty mine in Bolivia is the major world producer of ametrine.